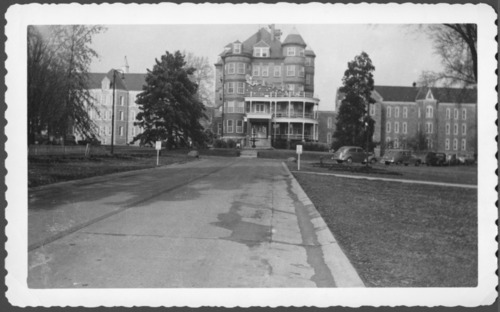 This photograph shows three buildings at the Topeka State Hospital in Topeka, Kansas. The Topeka State Hospital (earlier called the Topeka Insane Asylum), a state funded institution for the care and treatment of the mentally ill in Topeka, Kansas, was in operation on this site from 1879 to 1997. It was located at 2700 W 6th St. The first buildings in both Topeka and Osawatomie were designed by John G. Haskell, one of the architects of the Kansas State Capitol. This photograph shows three buildings at the Topeka State Hospital in Topeka, Kansas. The Topeka State Hospital (earlier called the Topeka Insane Asylum), a state funded institution for the care and treatment of the mentally ill in Topeka, Kansas, was in operation on this site from 1879 to 1997. It was located at 2700 W 6th St. The first buildings in both Topeka and Osawatomie were designed by John G. Haskell, one of the architects of the Kansas State Capitol.